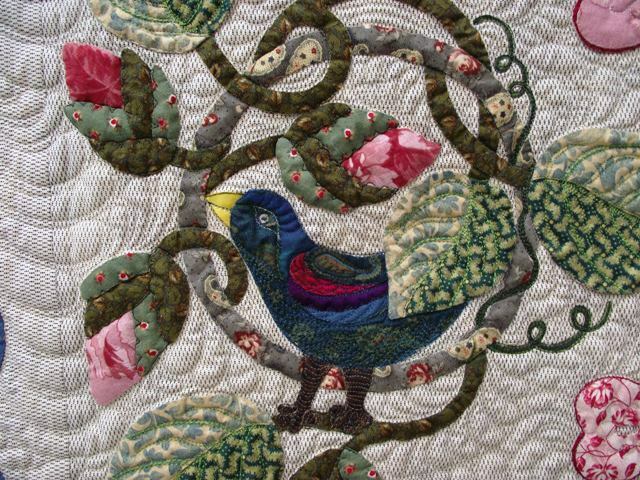 For the last 2 days I have been at theVic Quilter's Showcase, enjoying the show. 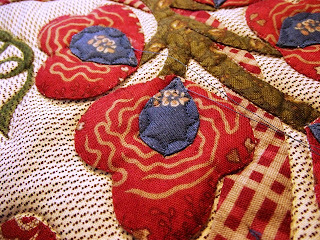 I am in a bit of a post production slump...quilting non stop for a week has left me feeling exhausted! Luckily there were so many great quilts to see at the show that I soon felt revived. Hearts Desire is hanging in a dark spot (this is almost unavoidable at quilt shows) due to the building and lighting set up. So photo's arent really working. I will try again tomorrow. I might be a bit biased, but Hearts Desire is sitting very nicely and is flat. And of course, I think it's beautiful. 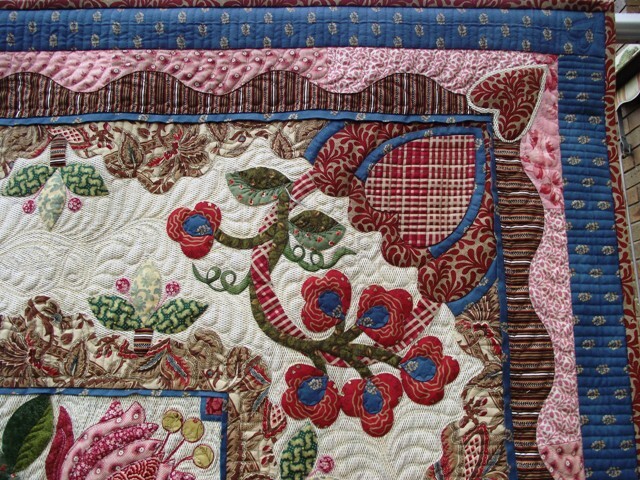 Thank you to everyone for all your warm and kind comments on my last quilting post - it's so nice to get feedback. Sometimes in blogland it can feel like you are talking to yourself! Thank you also to all the ladies who have approached me at the show, its always so nice to meet new faces and catch up with old friends too. I quilt for the love of it. But there's no denying that an award every now and then is very nice too. 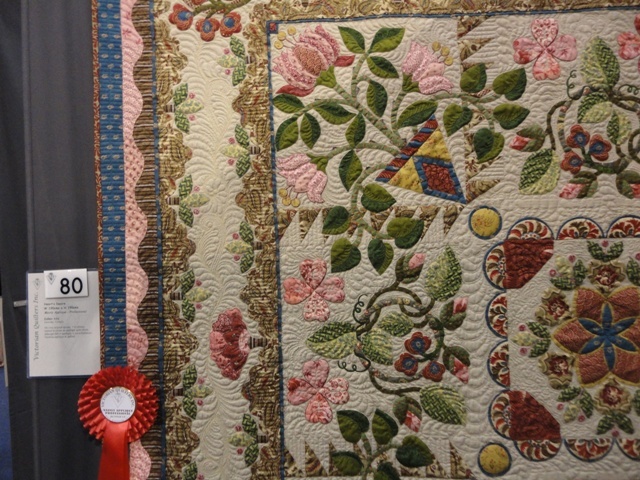 And of course I must mention Desley, who also reads this blog - as her quilt won Best of Show. Congratulations Desley! 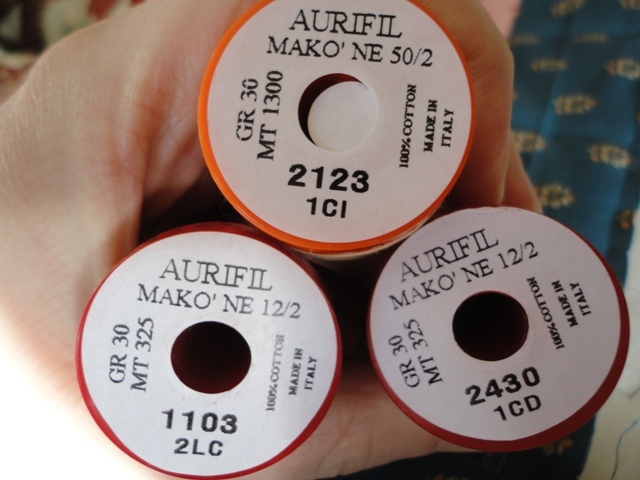 You got a Bernina (speaking of my Hearts Desire...who wouldnt love to win a new Bernina???!) Visit her blog to see it yourself. I do have a photo, but I took it sideways and blogger wont allow me to post it the right way up and ...urgh computers.... I refuse to post a picure of a Best of Show Quilt sideways!! 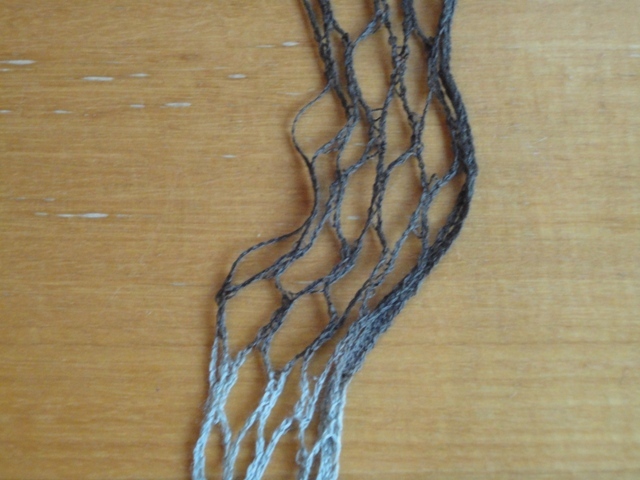 This is chain yarn. A friend of mine kindly thought of me when trying some out herself. This is the first time I have come across it and I have to say – I am hooked! 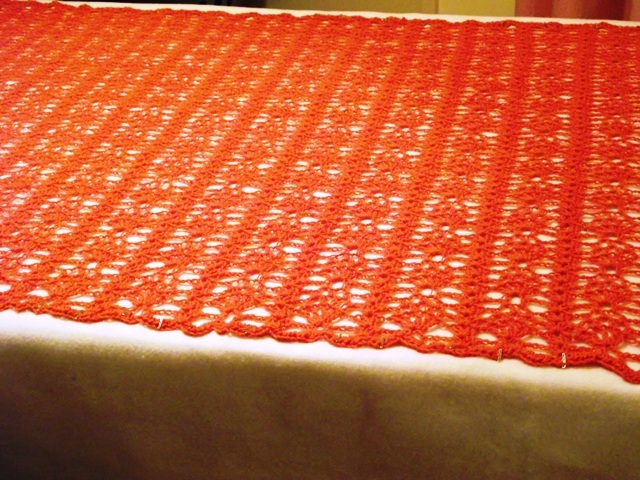 You chain on 6 rows and simply knit into every chain every inch. 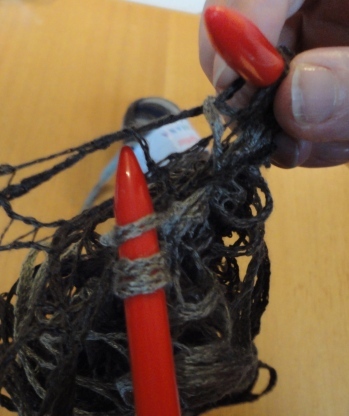 When it is wound it looks like thick yarn and when you start knitting you pull the yarn out and knit into the chain. It’s intriguing and I love the cascading (and effortless effect). 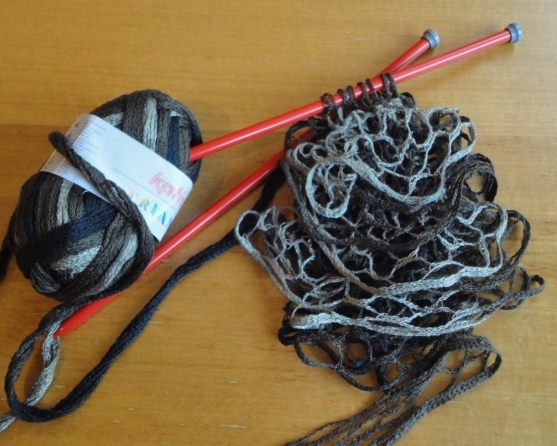 The yarn is from www.katia.eu, (manufacturer’s site) and I haven’t found an online store which stocks it yet. 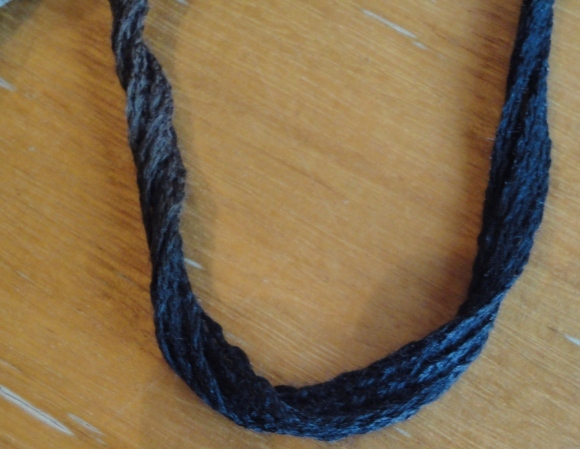 I would love to buy this yarn online, so if anyone knows where I can find it, please let me know as I would love to get it in a cotton or wool blend. 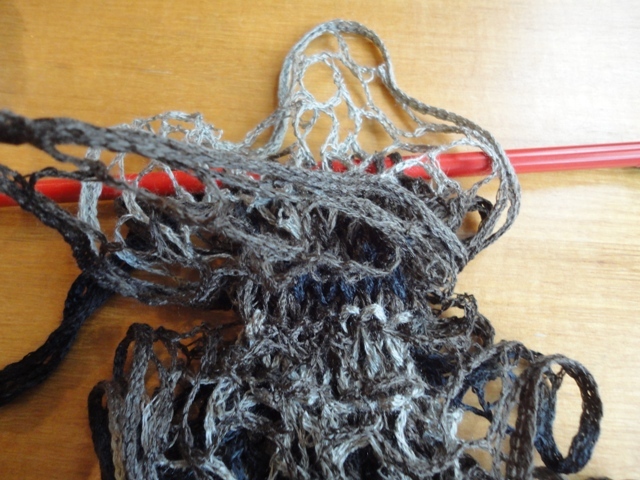 Yes, I know….I’ve started another WIP! It’s pouring with rain here so my DD and I waited with baited breath by the window until a few moments of respite opened up. Then we ran out, placed a cloth on the decking, wheeled out the quilt frame and finally got Hearts Desire hanging in just minutes... and starting taking pics straight away. I didn’t manage to take as many as I’d like because of weather conditions…but I here are a few I did get in before we had to run inside again.The top pic looks a little too yellow, that's down to strange lighting conditions outside. 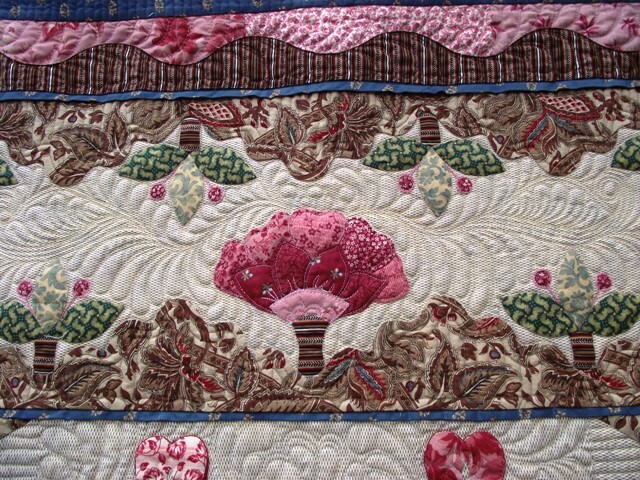 The quilting is subtle, I wanted to enhance the applique rather than showcase the quilting in this quilt. 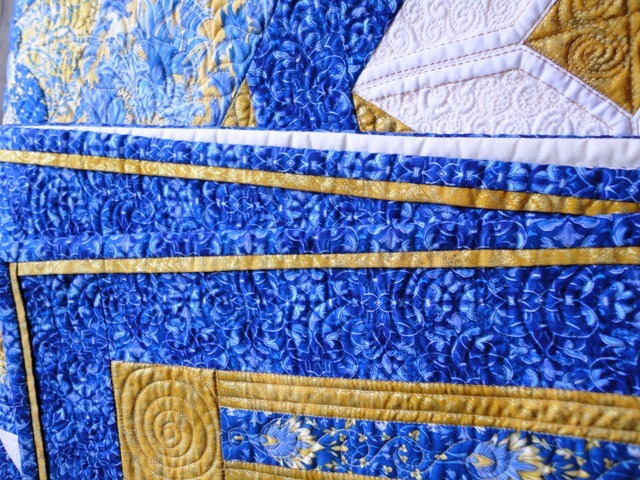 My initial thought was to quilt less….but I do love really quilting a quilt so that wasn’t really an option. It is heavily quilted – my usual style! That’s just the way I like it. 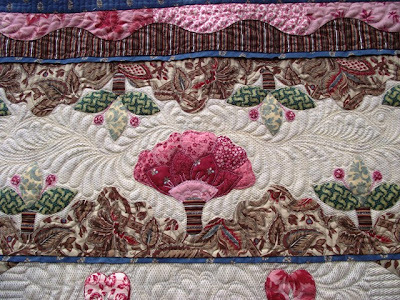 Hearts Desire is all about sentiment, double meanings and richness of detail. Those of you who are making it yourselves know, just how much time and commitment each block demands. Much work, much patience, much perseverance. 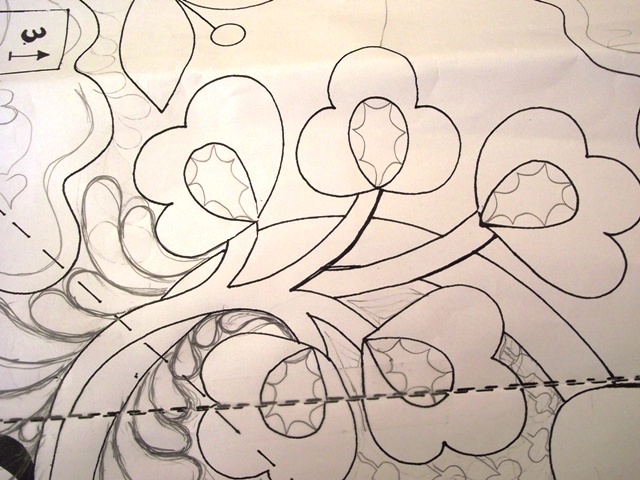 The motifs used throughout the design are traditional and invoke feelings of nostalgia and beauty. 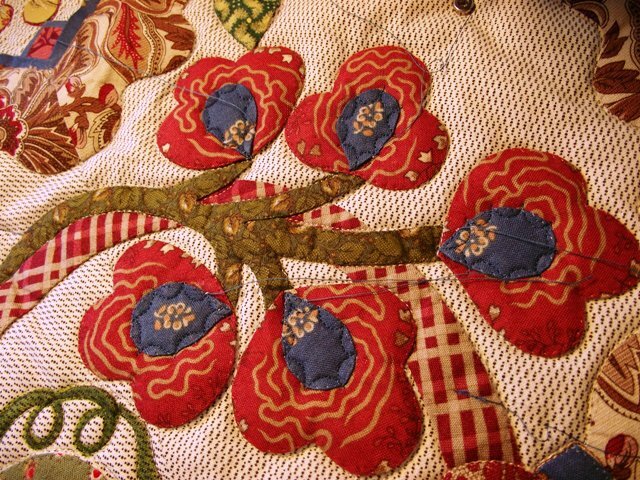 When I first designed Hearts Desire, I spoke of an ‘old town folk’ feel, a traditional, inspiring place. Richness of detail and a delight in fabrics throughout the quilt– symbolizing hope and the need we quilters have to create works of beauty. Details: The binding is on. The pattern finished at 83 inches for the quilt top and after quilting it went down to 79 inches. 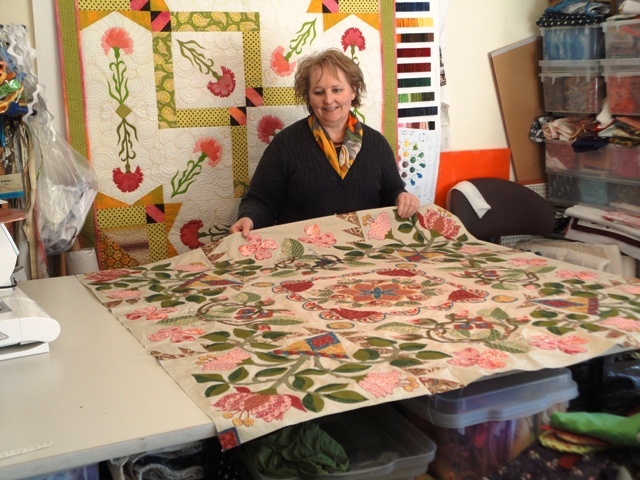 It will be hanging at Victorian Showcase in Melbourne from Thursday to Sunday. I will be there Thurs, Fri, Sat. 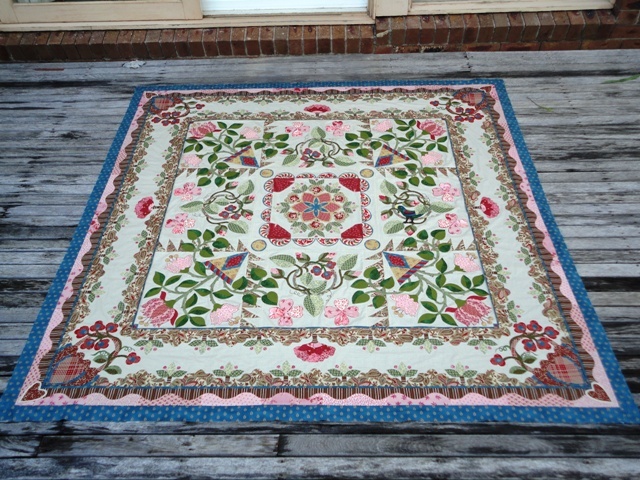 And now all I have to do is actually quilt it. 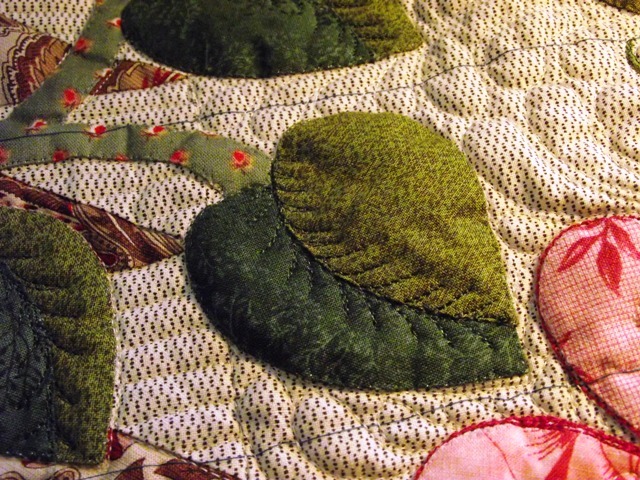 I’m not going to let my enthusiasm wane, so although I have so much to do, I have decided to stop my new project and instead start quilting Hearts Desire so I can have it ‘finished’. I managed to have Hearts Desire basted on Monday and this is a real hurdle out of the way. 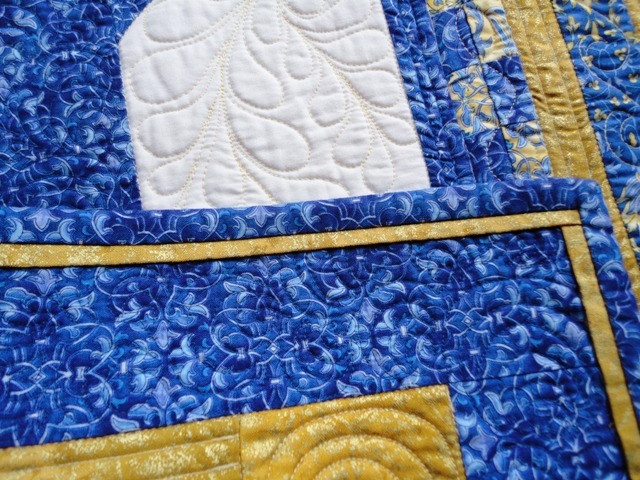 It’s such a treat to have a quilt ready to be quilted without tiring out my shoulders basting beforehand. 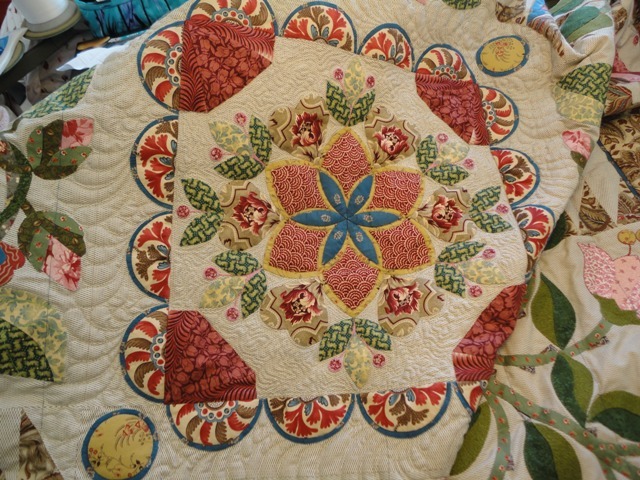 Now it’s time to quilt! 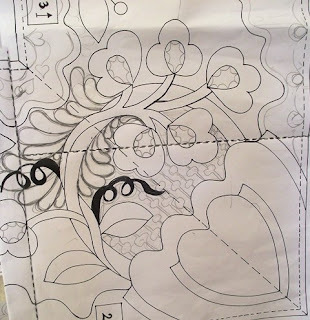 I always quilt freehand, so I have some rough sketches and I am improvising as I go along. 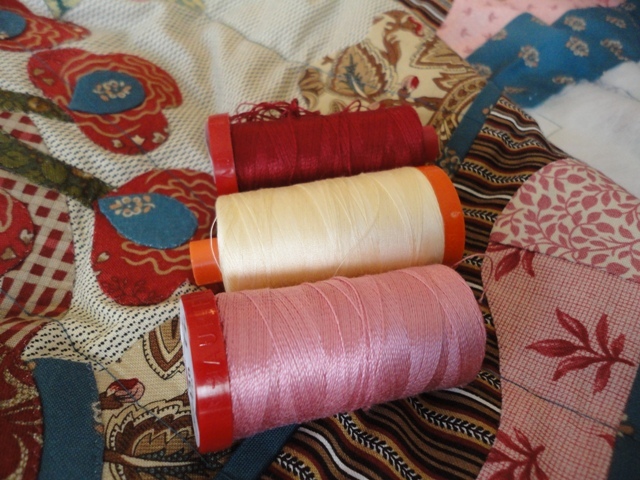 I have opted for blended thread and have decided on just going with the flow, quilting wise. 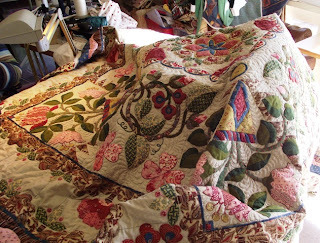 Sometimes, you can’t really ‘see’ a quilt until you reach this stage of the quilt making process. 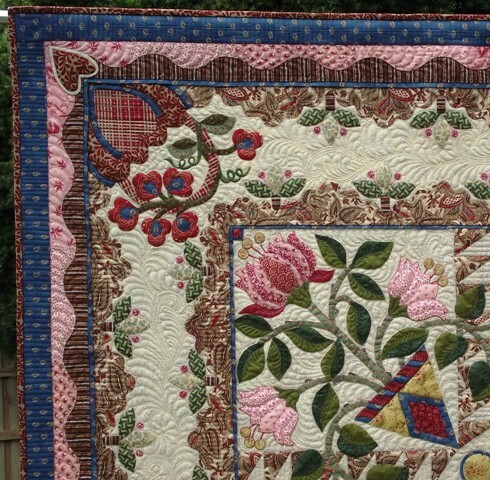 I chose muted civil war style fabrics, so this is my traditional old style quilt. 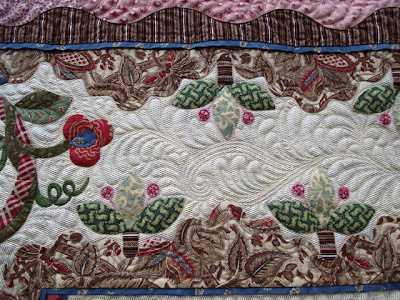 It’s the first of its kind on my quilt shelf – I want to have a really diverse range of styles and colours in my collection. I always try to do something a little bit beyond my own version of ‘ordinary’. 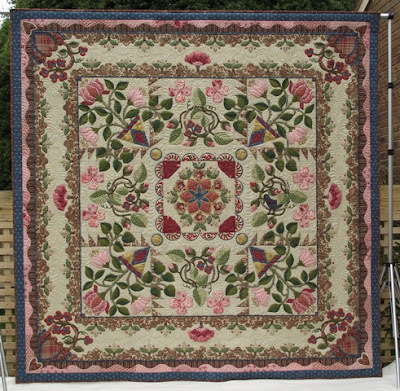 I can also see this quilt done completely in brights, so I may run a repeat because I am sorely tempted to dive straight into making another one straight away. When will I find the time??? and it is a technique which is used in Hearts Desire. It’s not hard to do and the effect is striking – especially when you choose a contrasting fabric. If you haven’t made it before, see how effective it is for yourself. 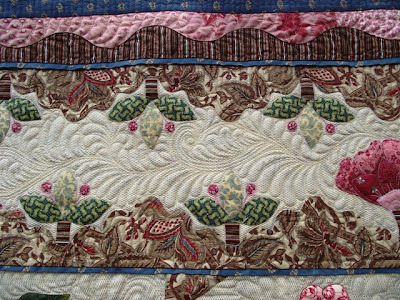 The flange is in gold and ripples towards the right hand side corner. and you can see more rippling on the right hand side of this photo too. 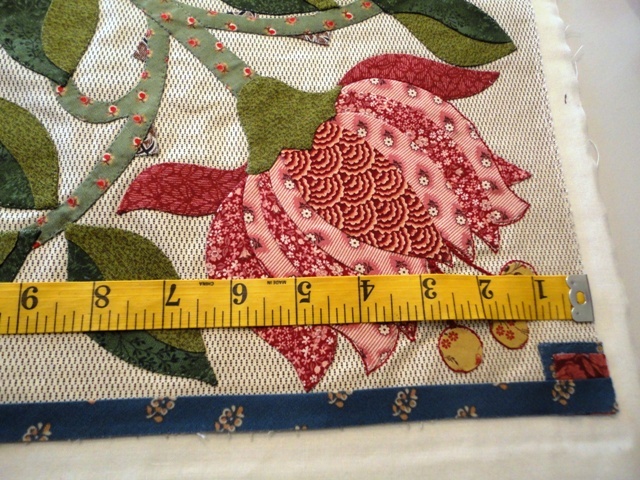 It's not noticeable unless you are looking for it - however as quilters, our eyes often are looking for things exactly like this, so you can always replace a flange with piping or flat 1/4 inch seam instead, if you wish. It's something to consider. and that's the beauty of flange - simple and effective. 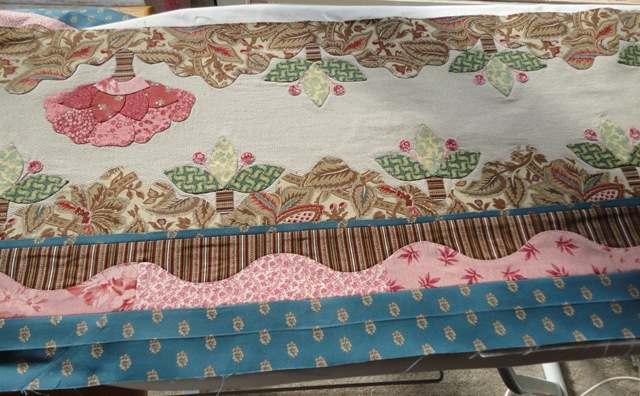 Join together all bias strips in a continuous length with diagonal seams. Press folded wrong sides together. This is our 3 dimensional piping which is called flange. Attach the flange onto the outer edge of the quilt centre. 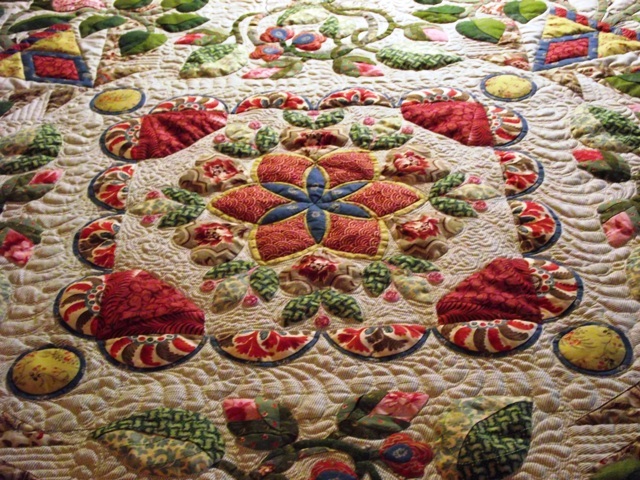 Use Elmer’s glue or pin into place—take care not to stretch the edges– have a tape measure ready to check the size. My centre of the assembled blocks measures 54 inches plus seams. Please measure yours. 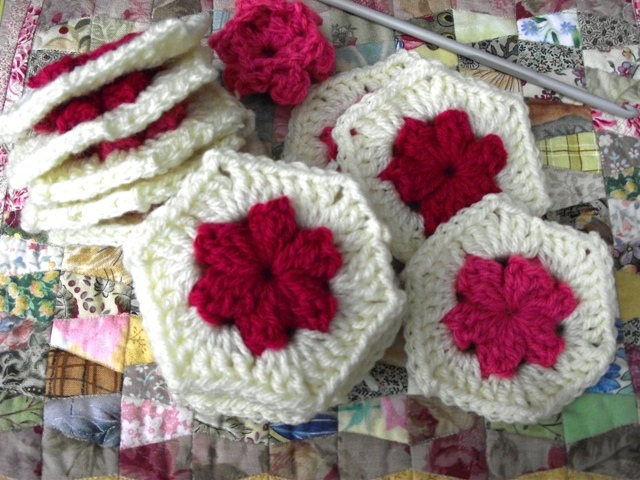 For those of you who have never made flange and would like a step by step How To Tutorial, visit Julia - she has kindly posted a flange tutorial and invites you to make use of it on her blog. Her button below will link you to her site. If her tutorial helps you, please remember to thank her. 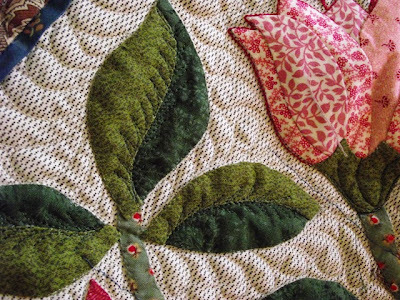 This month you are finishing the quilt top. You will be adding a few finishing touches to the first centre block, embellishing your applique if you wish and joining the blocks together. Hearts Desire was designed with 1 outlay, however my sample sewer put it together another way and I have offered this option to you as well. Once you have decided which ‘way’ suits your style, you will then be joining all the blocks together and adding the borders. I have been guilty of growing this quilt – it is now 83” at it’s finished size. This is thanks to the borders I could not resist adding. 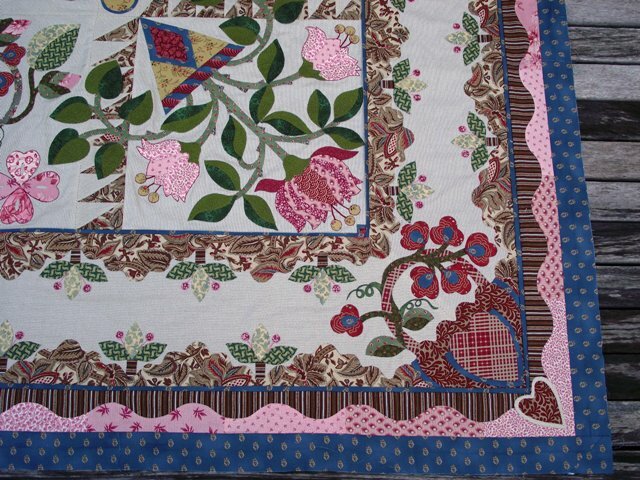 I really felt, having looked at the finished quilt top for a few months, that the extra curvy pink border was needed. Of course, whether you add this border is completely up to you. ﻿Really, I don’t feel I even need to say that anymore because when I see what has been created by you talented women, I just know you will make it your own and make it suit you. That is a real treat of the Yahoo Group – seeing the surprises and interpretations that come with each new listed photo. 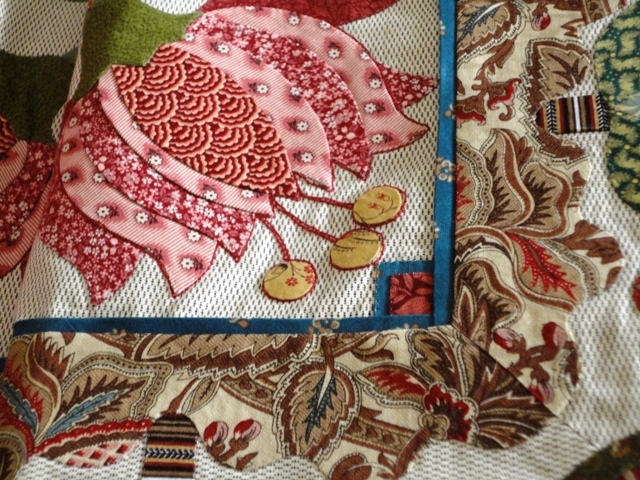 ﻿I know this mystery was difficult for some of you at times (so many pieces, so much applique!! ), time consuming all the time and being a mystery it was somewhat frustrating too. It was quite difficult laying out the monthly schedule when I sat down to do so because this quilt could very easily be a 12 month mystery – but therein is another problem. 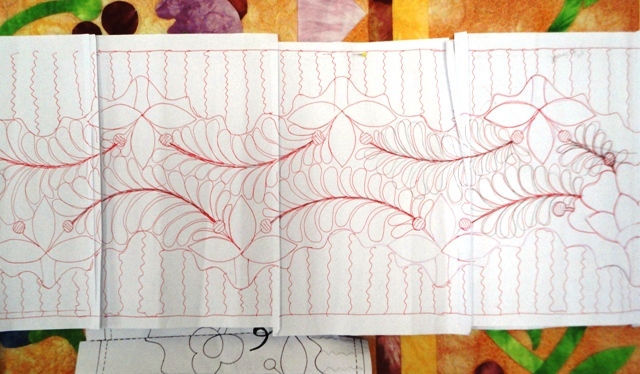 With work of this intensity, there was too much potential to meander and then relegate to the WIP pile. I did feel that the best approach was intense diligence. This is mostly because of my own schedule – I’m already on other projects and am moving at a slighter faster pace than usual. Many of you are still working through blocks in your own time, and interpreting blocks...and this is all wonderful and I do want to take a moment here to thank you for deciding to join me in the mystery. It takes a lot of trust to cut into beautiful fabrics and go along with someone else’s design, especially when you can’t see the end or even be sure that you’re going to like it. I hope that it has been as rewarding for you as it has been for me. 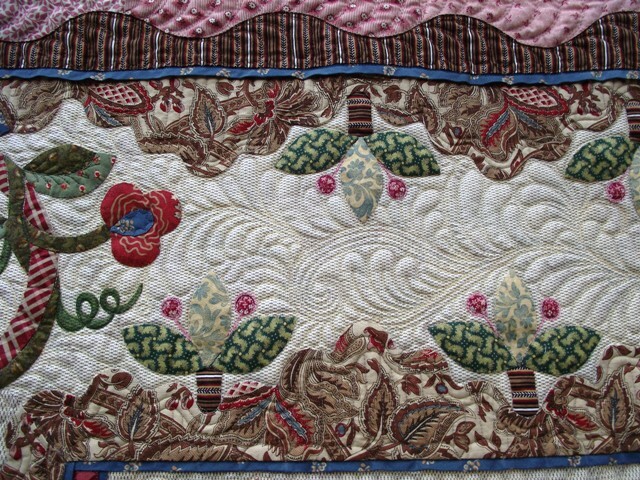 In the next week or two, I will be posting updates as I work through quilting this quilt. So if you interested in how I take my quilt tops into finished quilted quilts, stay tuned. 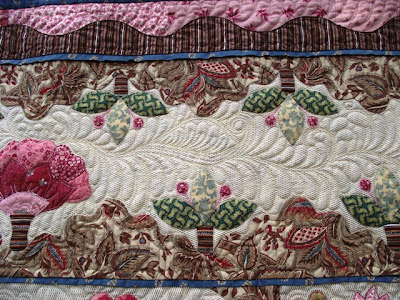 I will be domestic machine quilting Hearts Desire. 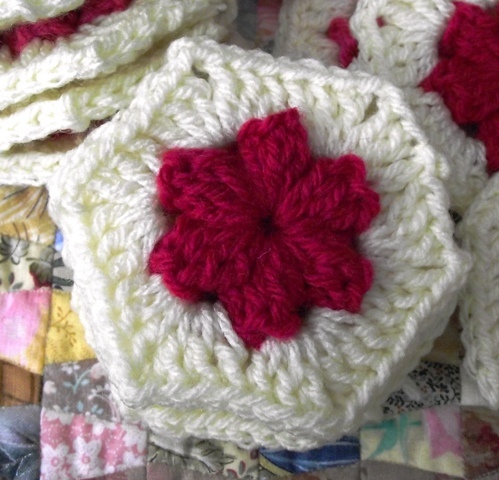 UPDATE: yes, I will be sharing this super easy puffy hex crochet pattern when I have completed the project. Stay tuned! add your own WIP below! I did say I wasn't going to do any new crochet projects this winter - well, not until I had my WIPs seriously under control. But then I found a crochet WIP (so that's an exception to the rule). I knitted it to be the same size in one hue stronger. 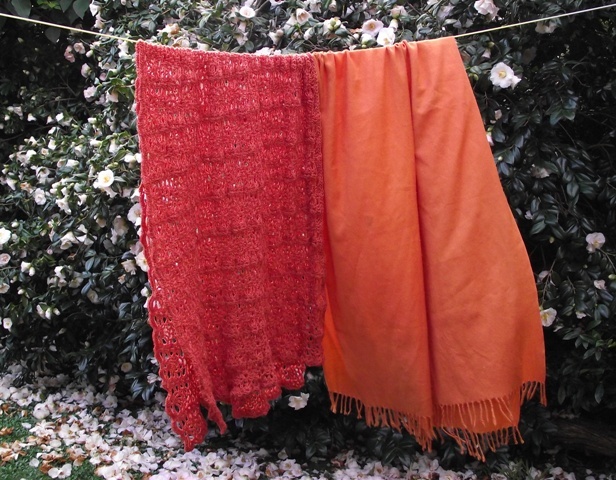 When it was finished, just yesterday afternoon, I hung it alongside my favourite shawl in front of my Camellia bush. 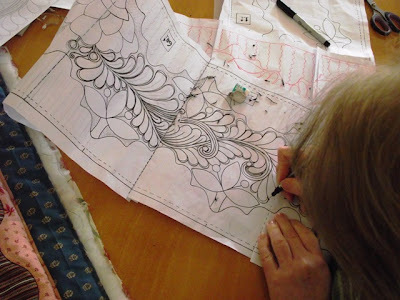 I simply worked rows of wide shells and narrow shells until I reached my desired length. I blocked it last night. 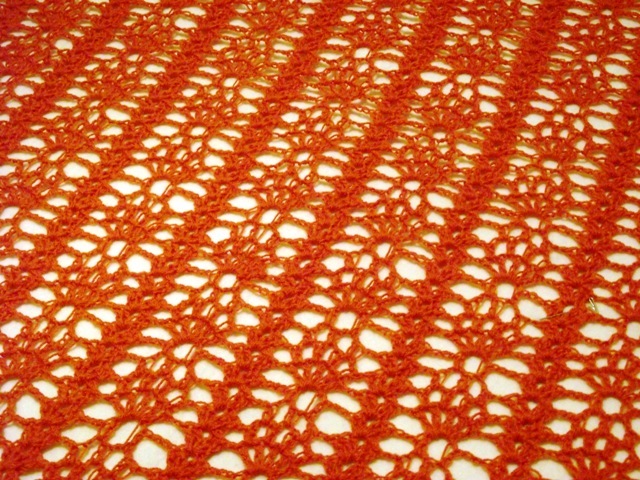 Now, I have differing thoughts on blocking. Sometimes it can deflate the natural 'loft' in the wool and you can end up with a (still beautiful) but flat work. 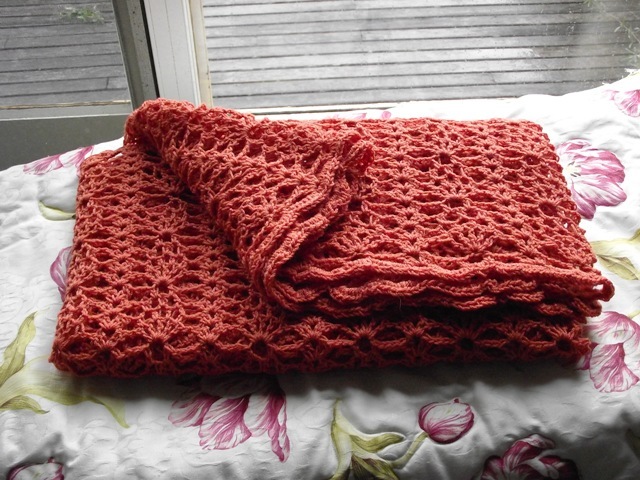 My last afghan never 'bounced' back after blocking and whilst I still love it, I wouldn't block it again. I thought I might skip the blocking process here, especially because I quite like the 'texture' of natural wool. 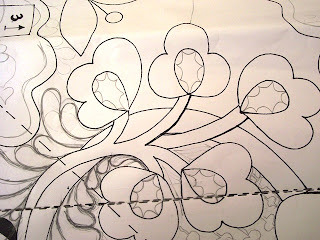 Yesterday, I realised that I had to gently block it to stretch the pattern into shape. 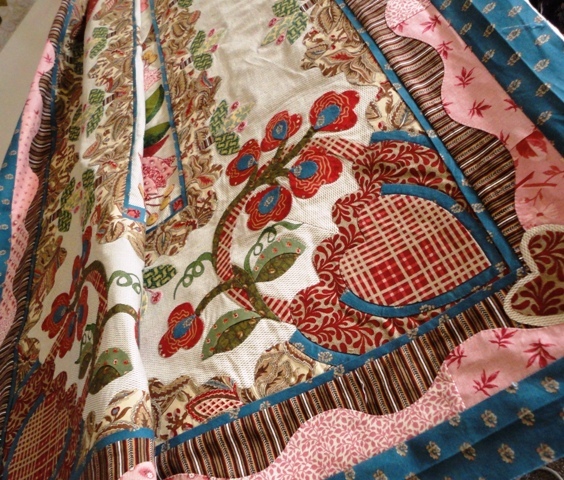 I simply pinned the shawl straight against a table edge (it was resting on felt, you can use a clean towel or blanket) and pinned the entire 'square' into position. Then I lightly misted with warm water. A blocking trick which has always worked for me, is adding a trusted starch to the warm water - just a little bit. By trusted, I mean a starch that you have used before and know does not flake or stain or chalk your fabric. 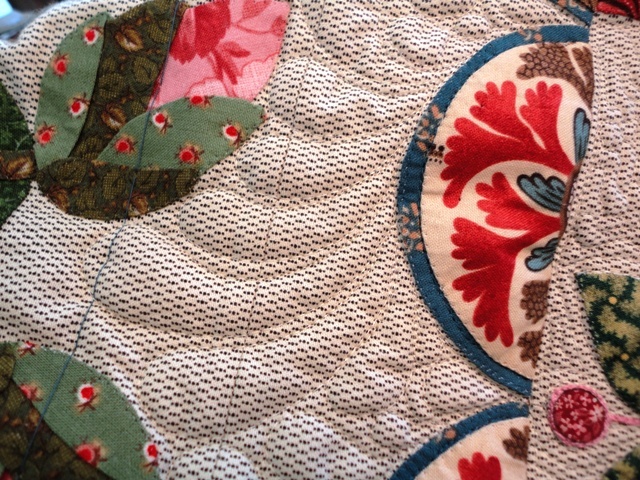 I always use and can recommend Crisp Spray Starch or the quilter's brand Mary Ellen. What's a little? Well, a very light misting over the warm water misting. I have found that it lightly repels dirt, dust and staining and keeps it's loft and spring better - without feeling or behaving starched at all. I left it overnight and as the house is warm inside, it set beautifully. This morning I unpinned it carefully and shook it out. Here it is, folded and ready to wear!